DeVry University Agrees To Stop Ads Touting Grads' Job Success Without Proof : The Two-Way The for-profit university chain has agreed to stop claiming that 90 percent of its graduates seeking employment found jobs in their field within six months of graduation. It was not able to prove it. 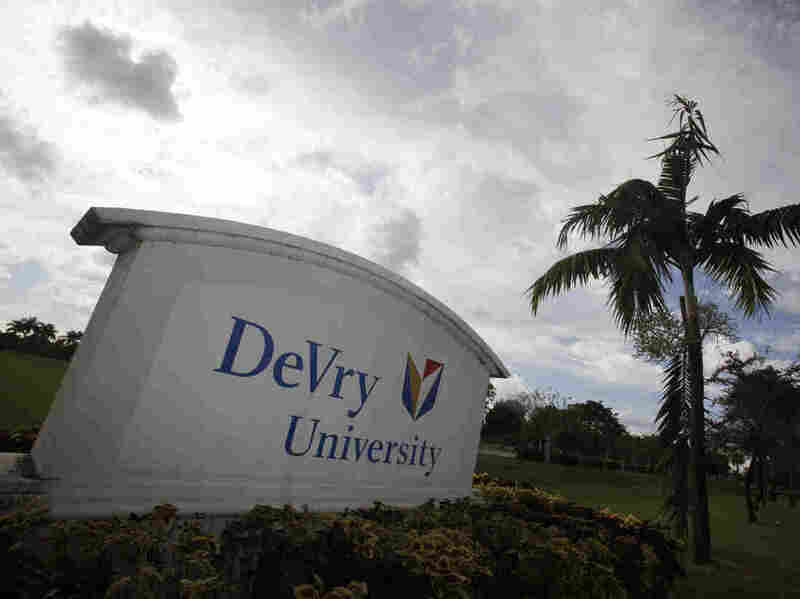 The entrance to the DeVry University campus in Miramar, Fla. The major for-profit university chain DeVry has agreed to stop making its often-repeated claim: that since 1975, 90 percent of its graduates seeking employment found jobs in their field within six months of graduation. That's because of a settlement announced Thursday with the Department of Education. In August 2015, the department requested that DeVry prove that claim, which it has used for years in radio, TV, online and print advertisements. Now, in a statement, the department said "DeVry could not provide evidence to substantiate this claim." "Students deserve accurate information about where to invest their time and money, and the law is simple and clear: recruitment claims must be backed up by hard data," U.S. Secretary of Education John B. King Jr. said in a statement. DeVry, which has at least 55 campuses across the U.S., said that it is "pleased" to have resolved the matter and will "continue to cooperate with the Department." It said that it was asked to provide student-specific data on graduate employment rates since 1975, and that it "lacked such student-specific data for the period from 1975 to October 1980." Under the terms of the agreement, as NPR's Eric Westervelt tells our Newscast unit, "DeVry must stop making that claim on any platform and post a notice on its website stating that the claim is unsubstantiated." That notice must remain on the website for a period of two years. "The chain must also submit to greater federal financial oversight," Eric adds. The agreement also requires DeVry to post a "letter of credit" to the department of more than $68 million. As The Associated Press reports, the money "can be used as a form of insurance for any liabilities caused by DeVry." As the Department of Education writes, "Today's agreement settles only the issue of a single, unsubstantiated claim and does not prohibit the Department from imposing future enforcement actions against DeVry in the event of additional findings." Separately, the Federal Trade Commission filed a lawsuit in January against DeVry over alleged deceptive advertising, as The Two-Way reported. It targeted the same claim as the Department of Education, and an additional one: that "its graduates had 15 percent higher incomes one year after graduation on average than the graduates of all other colleges or universities." This is part of a rising tide against misleading and deceptive advertising claims made by the for-profit college industry. As NPR's Anya Kamenetz has reported, there's now a "multi-agency assault mounted by the Obama administration's Department of Education, the Federal Trade Commission, many states and the federal Consumer Financial Protection Bureau, which was formed after the financial crisis in 2008." She adds that "as of last June, 28 for-profit colleges were under investigation, according to a report from the Brookings Institution."